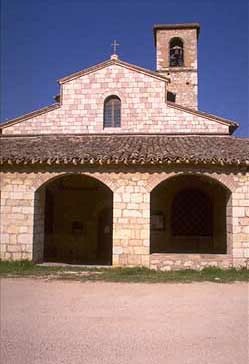 We have here a very interesting Romanesque church with three naves and an exterior portico on three sides. Both the interior walls and those under the portico are completely covered with frescoes. The name of the church Pietrarossa: "Red Stone" derives from a large reddish stone inset in the second pilaster on the right-hand side of the central nave; it it is pierced by a central hole from which water probably once flowed. A very old tradition, maybe of pagan origin, claimed that this water had the miraculous power of curing infertility. We learn that from time immemorial on St. John's night (June 24) an increase in the water levels of wells in the area was noted, and until the late 16th century the women of Trevi used to come here in pilgrimage that night and the night of the feast of St. Ambrose. Gregory XIII, who had been a canon in Trevi and was well aware of the custom, among the first acts of his papacy forbade such manifestations; they surely related to customs and beliefs harking back to paganism. Similar midsummer night pilgrimages and baths are documented in various parts of central Europe. The very numerous images of the Madonna that adorn the walls are only a few of those that could still be seen here as late as the mid-19c; in both number and quality they still elicit our admiration. The dates read on them, as well as critical analysis, place them in the 14th century. Among the names of painters that recur, those of Bartolomeo da Miranda and Valerio da Gualdo. Against the first pilaster on the right we can admire an elegant little marble altar attributed to Rocco da Vicenza, who worked here in the early 1500's and left one of his best works in the church of Sant' Emiliano.